I have personally had a lot of coffee machines in my life since I started in my line of work. The line of work I’m in requires me to meet deadlines and pull all-nighters. That is why I have fallen in love with my Lattissima Pro by Nespresso. I have had other machines by Nespresso of course, but this machine is by far the best. It gives me the perfect espresso every time, even my wife loves it. We have a daughter who just turned two and trust me when I say that having her and having to work constantly leaves you in need of more coffee than normal. This machine gets the job done and has the best look, upgraded features, and performance out of any of the other machines I have come to know in the past. For those of you that are not so familiar with Nespresso or any of the newer technologies from the world of coffee, the machine works using capsules (these tiny cup-like things that hold the coffee grounds, check Inexpensive Coffee Makers that Use K-Cups). Now, I am no scientist but I have done some research and have found that they are normally referred to as hermetically sealed coffee capsules by those that actually manufacture them. The reason that they created these capsules is not just because they are a perfect fit for the machines they are used in, but also because they keep the coffee fresh which gives it an amazing flavor. One of the greatest aspects of the capsules is that I never have to worry about the mess that normal coffee machines make when you are using filters and coffee grounds. The capsules are not overly expensive, usually being no more than $1.50 per capsule. Now, there are many different types of capsules available, giving you the option of choosing between a wide variety of roasts which come in both caffeinated and decaf. My wife and I always go for the caffeinated variety of course, and we usually buy the Koffee Kult Dark Roast which has an amazing flavor. I absolutely love the look of my Lattissima Pro, it certainly makes my kitchen look better than a normal coffee maker would. The design is very amazing really. It has a look of elegance with its stainless steel design and it would certainly lift up the space of any kitchen or office space. 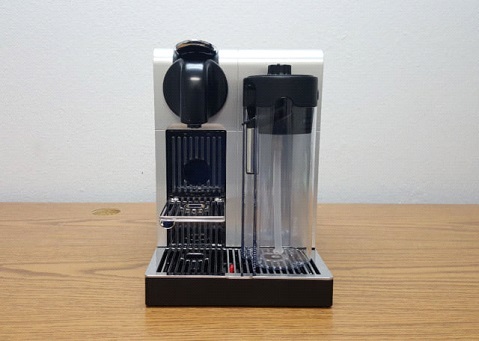 It comes with a metal cup rest that you can fold back in, very similar to the other machines of Nespresso ( check Nespresso Citiz C111 Review Nespresso C75 Prodigio Review Nespresso Pixie D60 review ) which normally come equipped with a removable cup rest. Unfortunately, my giant coffee mugs have become obsolete at this point thanks to these machines. With this machine, the biggest cup sizeable to fit is 5.5 inches tall and you can also use the smaller espresso cups of course. One of the things that I find great about the machine is that it comes equipped with this tiny light that aids in figuring out exactly where you can put your cup so that you don’t have to worry about waking anyone up or burn your eyeballs by turning the lights on too early in the morning. The Lattissima Pro comes with a removable milk holder that you can just slide right into its spot when it is needed, that way you can clean it easier or put it in the fridge if you didn’t use all of the milk in it. Now, I was able to test out the earlier versions of the Lattissima and trust me when I say, they have come a long way from having people complain about spills because of no lid locks. There is also a spout for the hot water that you can see when you look behind the sliding door at the side of the machine. If you are worried about making a huge mess when trying to get water into this beast of a machine, don’t worry. This machine is very simple to use in every way possible. All you have to do is pop the lid to the water holder and you can fill it without even having to take it out of the machine. As far as sizes go, this machine is almost 11 inches tall, which is a pretty good size. It certainly does not take up a lot of space in our house. The Lattissima Pro control panel is one of my favorite things about the machine. The control panel itself is a touch-sensitive one that offers a lot of choice for what kind of drink you would like. The options are between the Espresso (of course), the Lungo, Cappuccino, Ristretto, Hot Water and Latte. Now, the machine is very simple, as I mentioned before, so all you really have to do is put a capsule in, close the machine, push the button matching the drink you want and out comes the perfect taste of coffee. The touch panel is really great because you can adjust it to your preferences, like more milk or stronger espressos. Cleaning the machine is also very easy, at just a click of a button. My wife and I have had the Lattissima Pro for awhile now and have found it to be a lifesaver. From giving us perfect cappuccinos to espressos, this machine can pretty much do everything. With this machine, you can say goodbye to trips to the cafe and long lines and say hello to coffee being ready for you in less than 40 seconds. It is hard not to fall in love with an amazing quality machine such as this one, especially if you are thinking of trading in a traditional coffee machine for this one. The machine is a little bit pricey, but when you think of how much time you save, the amazing taste and how much money you save in the long run, it becomes completely worth the price. The Latissima Pro has been in our household for a while now. We love the sleek look and how easy it is to use. It’s a great hit when we have friends and family for dinner because of the variety of drinks it can make.